The Stanley Picker Gallery were delighted to invite students from Kingston University’s Faculty of Art Design & Architecture and retired members of the Bradbury Centre (Staywell Foundation) to participate in a special intergenerational Book Binding for Beginners workshop led by our very own Gallery Coordinator and professional hand-bound book maker. The workshop’s offering was inspired by Seroxat, Smirnoff, THC, our current exhibition of drawing, painting and writing by acclaimed artist, zine-maker and Stanley Picker Fellow Laura Oldfield Ford. Participants began with a visit to the exhibition and viewed examples of Oldfield Ford’s zines alongside the self-published works of Thomas, who addressed her practice throughout. 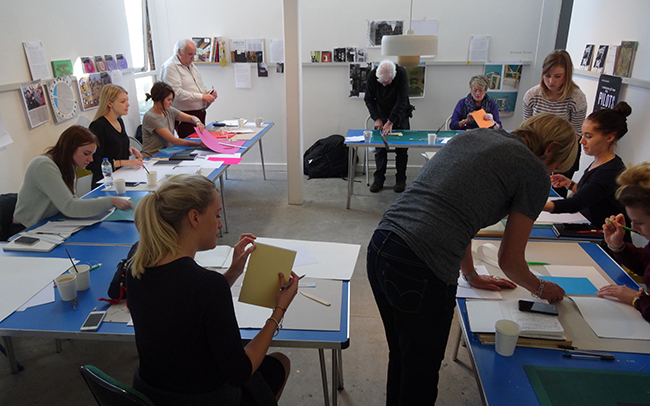 A “patient and interesting” workshop leader, Thomas guided participants through the basics of professional book binding, process and materials, while encouraging them to incorporate elements of their personal style, artworks and writing into the binds. Outcomes will be exhibited at the Gallery in late November as part of our Zine Fair and Participation Programme Showcase. Jacqueline Thomas will be exhibiting at Art and the Quantum Moment Exhibition 4 Dec 2014 – 29 Jan 2015 at the Simons Center, New York.